On a snowy February night, Principia College hosted Monitor Night Live to a full audience in Wanamaker Hall. 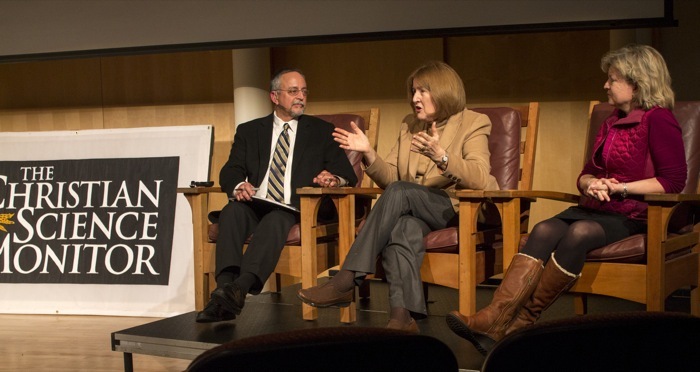 On stage with the paper’s editor, John Yemma, were the chief political correspondent, Linda Feldmann, and the politics editor and deputy Washington bureau chief, Gail Russell Chaddock. The Jerusalem bureau chief, Christa Case Bryant, participated via satellite. Reflecting on the evening, mass communication professor Paul Van Slambrouck, who served as the Monitor’s editor from 2001–2005, underscored the impact of Monitor Night Live on student learning: "It shows students the importance of accurate information and clear thought and engagement. Monitor journalists demonstrate a willingness to address the world's most serious challenges—and to do so with courage, humility, and even humor. I can't think of better role models for Prin students."